Van’s off the Wall and Riddim Wise are proud to present the 16th edition of Drop The Riddim, featuring live from Jamaica, Turbulence and Lutan Fyah. Friday november 28 at Le belmont, 4483 St-Laurent. 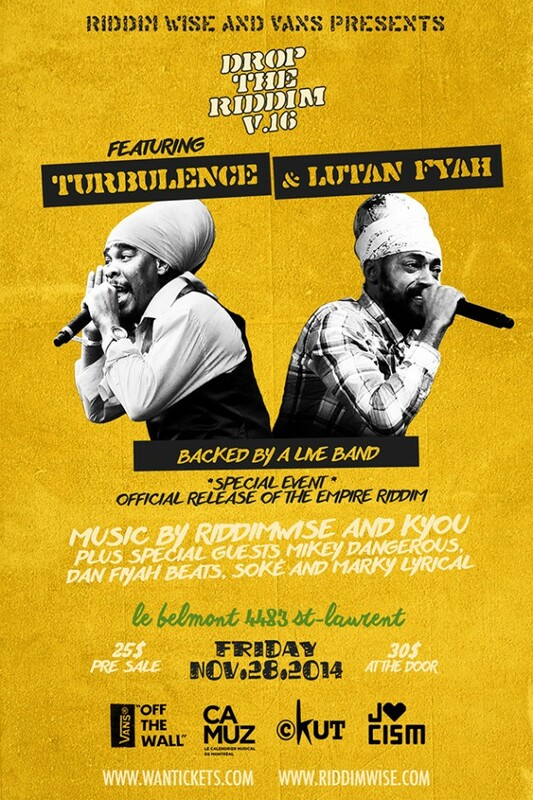 For the occasion, Riddim Wise will also be releasing their new production “The Empire Riddim” featuring a collaboration between Lutan Fyah and Turbulence, and songs by Anthony B, Exco Levi, Jah Mason, Spectacular, Mikey Dangerous, Dan Fiyah Beats, Soké, Marky Lyrical and Face-T.
For the first time in Montreal, Lutan Fyah, and for the first time in 7 years Turbulence “The Future“, will both be performing on the same stage. Hosting and music provided by Kyou and Riddim Wise. Tickets 25 $ in advance, 30$ at the door, on sale at Triple AAA (6895 Victoria), Utopia (159 Duluth) or online at www.wantickets.com/droptheriddim . Limited number of tickets available.